The secret recipe to a perfectly grilled pork chop from an Ohio hog farming family. This post is sponsored by the Ohio Pork Council. They have compensated me for my time, arranged the visit I'm sharing today, enjoyed the delicious grilled pork chops, and supplied me with loads of pork products I'll be using in recipes to come. 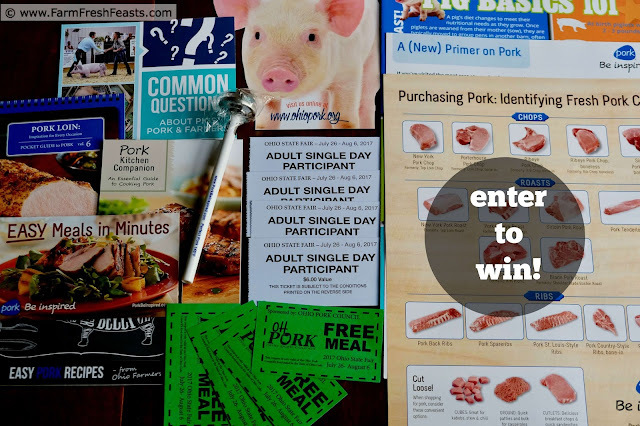 Want to win a Family 4 Pack of tickets to the 2017 Ohio State Fair PLUS coupons for 4 Free Meals at the Ohio Pork Council Food Stand in the Taste of Ohio Café? Scroll down to the bottom to enter! This time of year there's a buzz to shop locally and support small businesses. 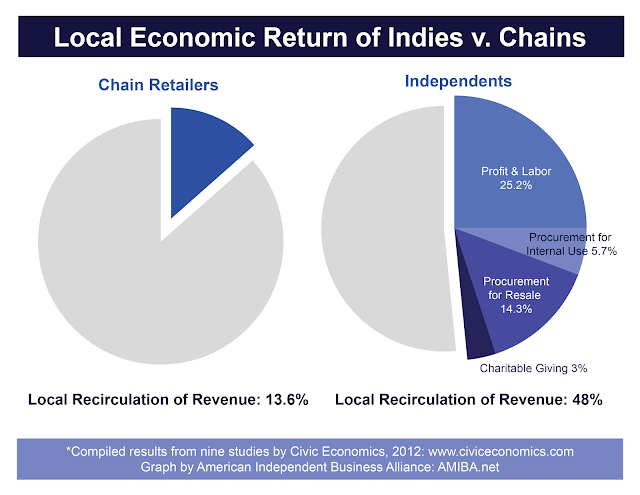 I know that by choosing to spend my cash in a local business, nearly half of each dollar spent stays in my local economy. That money will keep on circulating around, supporting the people and places near me. That's why I buy local. Well, that and I think fresh food tastes better so I may as well enjoy it. I want to challenge my readers to expand their support past a single day of the year, and commit to making one Saturday a month Small Business Saturday. I've got an idea for you--instead of just buying holiday gifts from small businesses once a year, what about staples? Can you think of an item you could source locally? How about food [this site is about food, after all]. Perhaps a condiment, spice rub, loaf of bread, honey, eggs or meat? Choose to buy that item exclusively from your local source for the next 4 months. What about gifts for other people--in the form of gift certificates to local businesses? Talk about a win-win situation! I've been supporting my local farmers by participating in a Community Supported Agriculture (CSA) farm share for over a decade. I started this website to help other folks like me make the most of the fresh produce both while it's seasonally abundant and by putting it by so I could keep on eating locally even in the winter months. Over the past couple years I'm learning how convenient it is to source my meats locally as well. Once my spouse decided to stop eating meat unless he knew where it came from, it became imperative for me to up my local meat game. When the Ohio Pork Council invited me to tour a local hog farm I immediately emailed my spouse and asked, "are you free next Monday to go visit a farm with me?" Many photos in this post where taken by him. 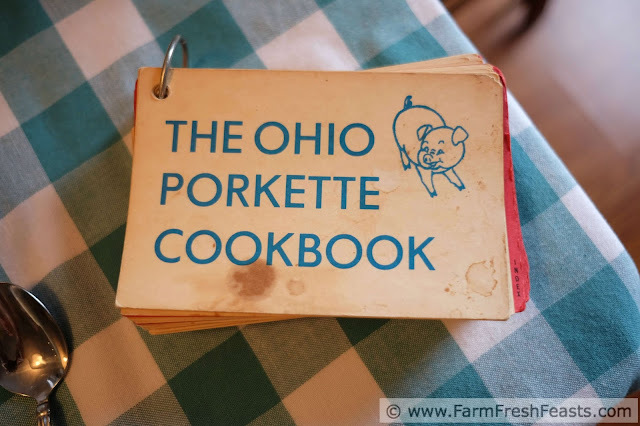 Now, before I get to the farm visit, I'd like to share a little bit about Ohio Pork. If you're buying pork at the farmer's market or at a farm store you can be reasonably sure it was locally produced. 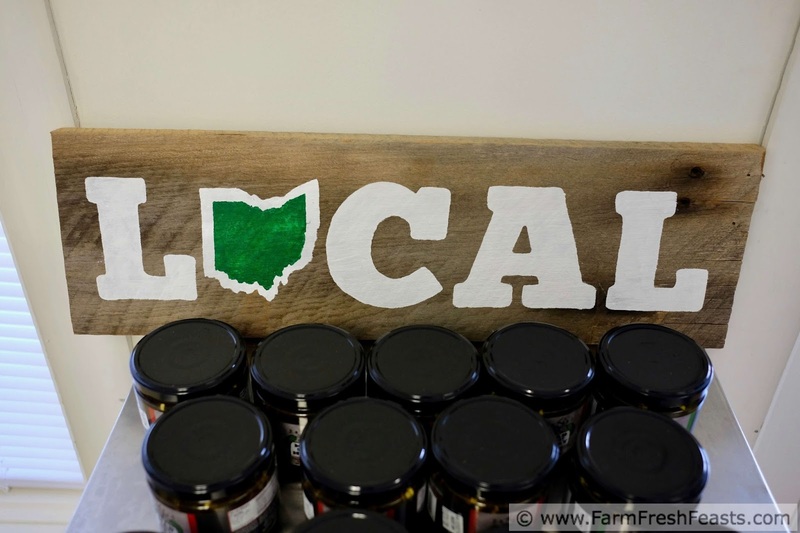 Did you know that by buying pork sold at grocery stores, like the Kroger down the road, you continue to support Ohio farm families? 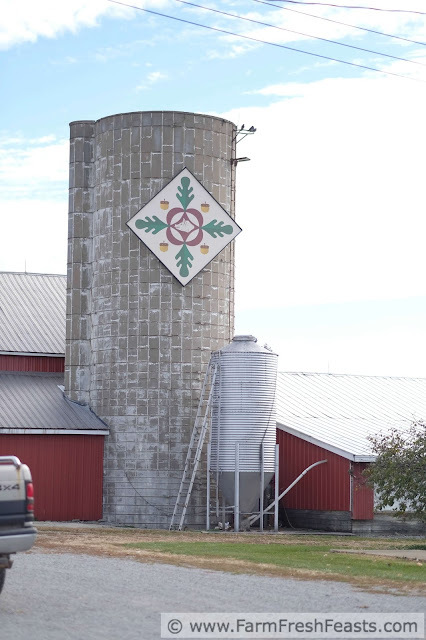 There are 3,500 farms in Ohio raising pork--for our region and for a lot of the East coast as well, as Ohio is one of the closest pork-producing states to one third of all Americans. 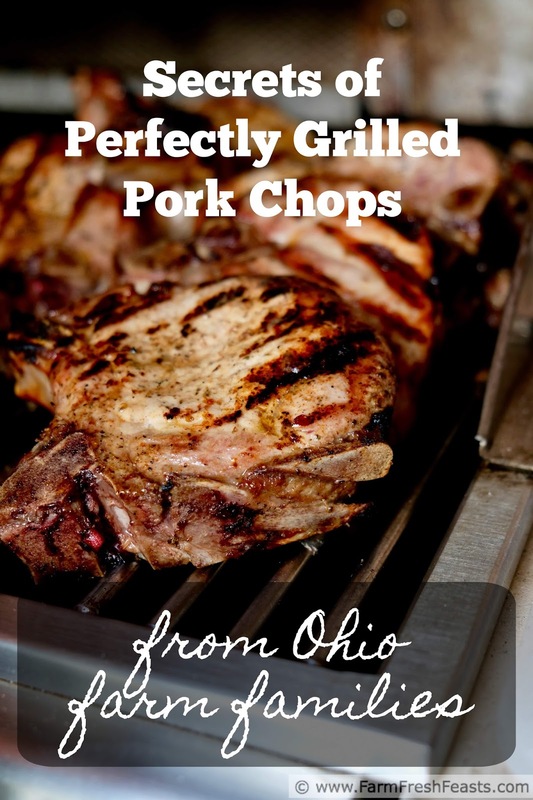 Click here for more information about Ohio Pork. Now I'll tell you a bit about the Ohio hog farmer I met, Mark Runyan of Oakview Farms, before getting to the title of this post--the Runyan family's secret to the perfect grilled pork chop. 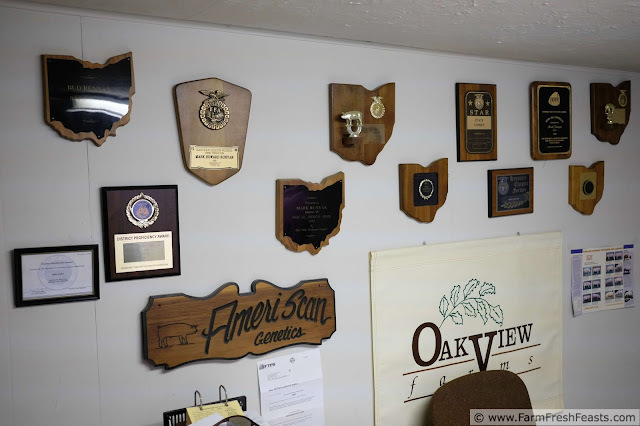 Oakview Farms is a 4th generation hog farm located in Urbana, Ohio. During our visit we met with Mark's parents, Bud and Ruth, as well as his son Myer. Bud and Ruth live next door to the store, Oakview Farm Meats, and we divided our visit between the 2 places. I learned so much and I am afraid I'll skip over some parts [I may know a tad more than a civilian about pork production thanks to my degree in Animal Science] and I don't know what you don't know, you know? For example, when you buy meat at Oakview Farm Meats, or at the farmer's market, that meat is frozen. Why? Just like Clarence Birdseye knew that freezing vegetables right after they are picked ensures the best quality product, freezing meat after it's harvested results in the best quality product. Yes, it makes me need to plan ahead to use move meat to the lower shelf of the fridge to thaw the day before, but it's worth it. You can't beat that kind of freshness. 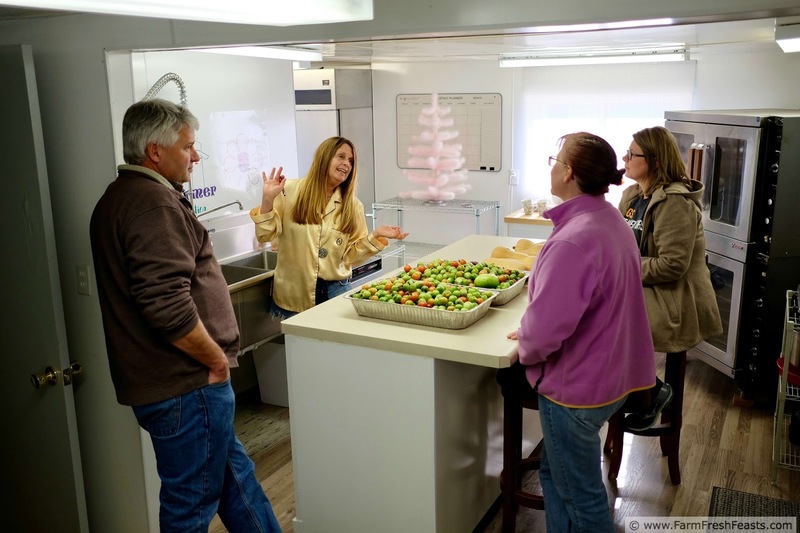 I was expecting to see some pigs on this tour, but I didn't and I'll tell you why: biosecurity. The Runyans care more about the health of their livestock than they do about my desire to take a picture with a pig, and that is how it should be. We all carry germs with us, and if my germs were to get a pig sick, they'd need antibiotics. To avoid needing to give hogs antibiotics it's just easier to make the barn a secure facility. So, no piggie pictures. Check out this barn quilt, instead! In addition to routine antibiotics, do you know what else these pigs don't get? Hormones! Hormones are not permitted for use in growing pigs. Period. This is a federal regulation. Pork producers don't use hormones. End of story. What about GMOs? There are no genetically modified food animals on the market. What about hogs being indoors vs out of doors? The answer to this question makes sense to me--as pigs have skin similar to ours, pork producers do their best to keep their livestock comfortable. That means keeping hogs cool in the summer and warm in the winter. That way, the pig's energy is used towards growing, not to regulate its temperature based on changing conditions. After all, the most efficient way to get the pig to a market weight is the most cost effective for a pork producer, and we're all looking for value. Each time I talk with farmers I come away impressed with the breadth and depth of knowledge in their chosen fields and amazed at how small our planet is. Earlier this year I visited with John Ludy, a cheesemaker in Wisconsin (and my Dad's high school classmate) who has travelled to Eastern Europe and South America sharing new ideas in cheesemaking. Mark's been to Sweden, Mexico and China in efforts to produce a quality pork product from the ground up, so to speak. You see, when folks began breeding hogs to be more lean and muscular, that carried with it a piece of DNA known as a stress gene--the animals didn't fare well when handled. 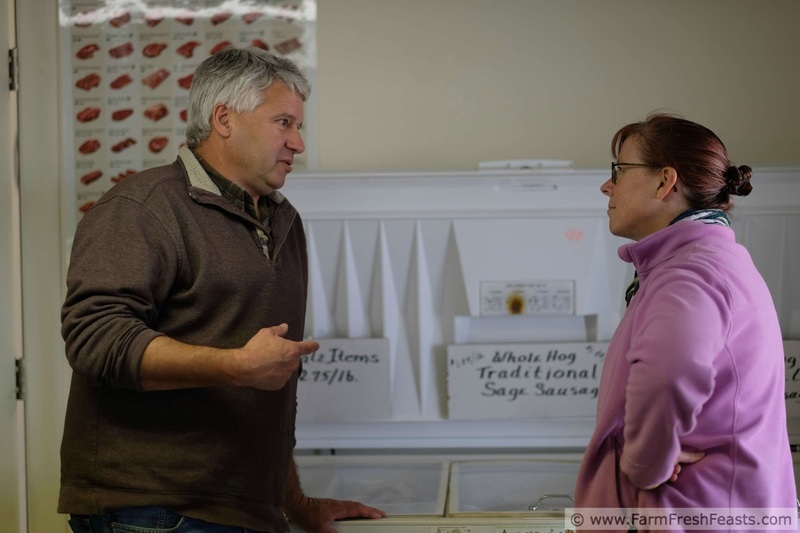 When Mark Runyan shared how his family emptied their farm and started from scratch with Swedish hogs 20 years ago it just reinforced the fact that farmers are constantly trying to improve using the best research available. By starting over with the Swedish hogs, which do not have the stress gene, Mark is helping pork producers improve throughout the world. His son Myer is a recent graduate of OSU so I'm interested to see what the future brings. From the DNA of the animals to their living conditions, care is taken by the Runyan family to produce the best pork that they can at Oakview Farms. Mark's newest venture is with Pam Bowshier, of Cosmic Charlie Breads and Threads. I first saw Mark & Pam two years ago at the Montgomery County Food Summit, where they spoke about their virtual farmer's market (I wrote about it here). Together they've formed Hippie and the Farmer. 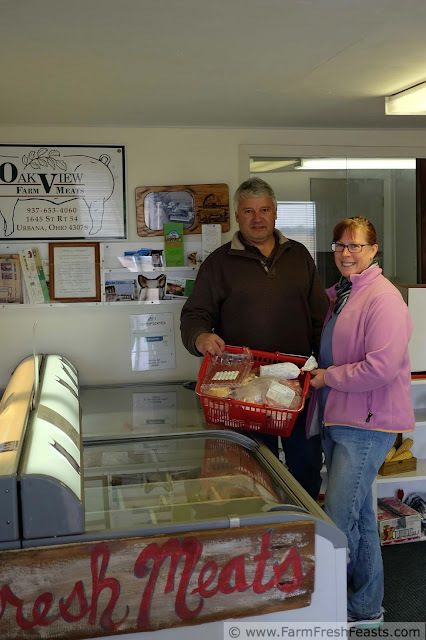 This started when Pam was selling her vegan breads and Mark was offering samples of grilled Oakview Farm meats. They put their products together [like peanut butter and chocolate in a Reese's cup] and the result is a savory success. In the summer months they offer a Harvest Moon subscription box with produce, meats and breads. In the winter they offer a Cucina Rustica box--farm fresh frozen dinners. That's a great way to make eating locally-sourced food accessible to a wide variety of folks. Stay tuned, I've got a bunch of recipe ideas from this gem! 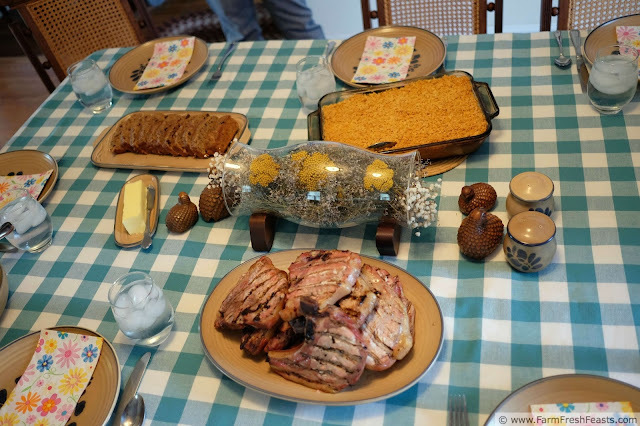 In the coming weeks, I'll be sharing another one of the Runyan family's favorite ways to enjoy pork, Ruth's Sweet Sausage Bread, but for now I wanted to share what we ate for lunch. Bud grilled up these absolutely perfect pork chops, and Ruth supplied delicious side dishes (as well as breakfast at the beginning of the visit--bacon inside the cinnamon rolls? You bet!). 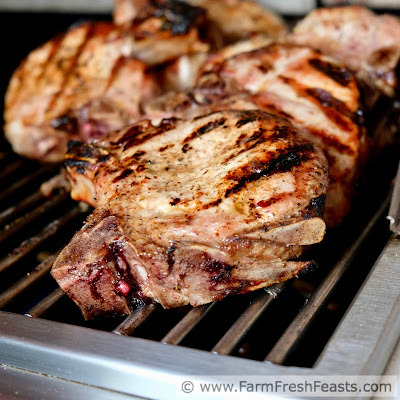 When I asked for a favorite recipe to share, all three generations suggested these pork chops. We certainly enjoyed them, and I hope you do as well! Preheat grill to direct medium heat, about 275 degrees Fahrenheit. Sprinkle Lawry's seasoned salt on both sides of the chop. Grill for about 5 to 8 minutes, then flip to the other side. 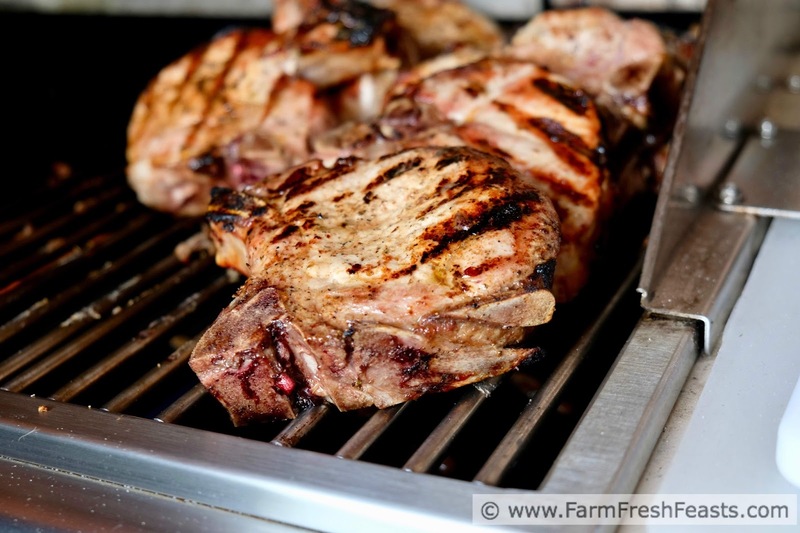 Continue grilling until the internal temperature is 145 degrees Fahrenheit, another 5 to 8 minutes. Serve, and if you're lucky enough to have some of Ruth's hash brown potato casserole and sweet sausage bread (recipe here) you're lucky, indeed. 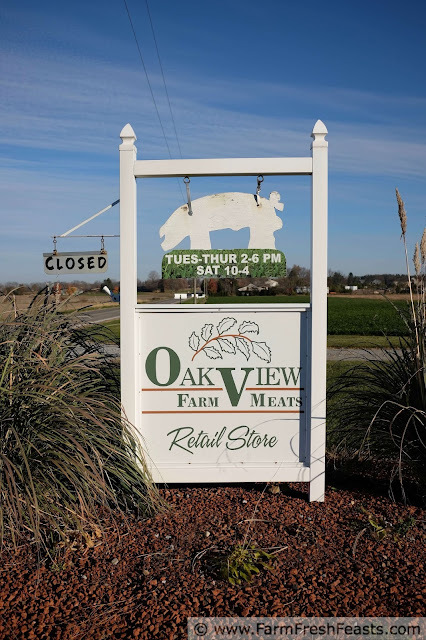 For more information on Oakview farm, including hours and location, please click here. For more information on cooking pork, please click here. For more information on Ohio Pork, please click here.